Once the toast of the video game arena, the humble side-scrolling fighter has fallen from grace in recent years. While we've seen notable titles that have tried to resurrect the genre - such as the brilliant Wulverblade - it remains a relic from a bygone era; a style of game that was arguably most at home in grubby amusement arcades which are all but extinct. You might assume then that spending the past few years creating a side-scrolling brawler might be a fool's errand, but husband and wife team Nic and Anna Makin - along with artist Jay Howse and composer Steve Burke - have been pouring every spare moment they have into creating what they hope will be the true successor to the likes of Capcom's Final Fight and Sega's Streets of Rage. They've been working on Raging Justice for quite some time, and now - with help from Team17 - the Switch launch date is just around the corner. Since we last reported on the game, there have been some big changes. The most significant is that a third character has been added, giving the player three different play styles to master. This brings the game more in line with genre classics, which tended to offer a trio of playable heroes. Secondly, we've had confirmation that the game will retail for £9.99 / €12.99 / $14.99 when it launches on May 8th, with a 10 percent launch discount for one week. From what we've seen, that makes this something of a steal in terms of value. 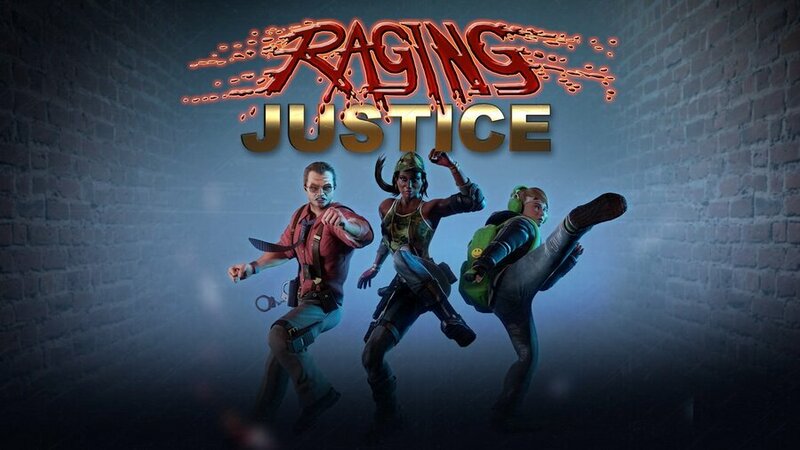 Given that arcade games were all about two-player co-op, Nic thinks that the Switch is perhaps the ideal platform for Raging Justice; you can play in tabletop mode with two Joy-Con, which means that a co-op session is almost effortless to set up - as long as you have a willing companion, of course. Nic also reveals that he was able to get the game running on Switch within days of receiving the dev kit, and has nothing but praise for Nintendo's hardware. He also goes into detail about the game's unique pre-rendered look; he sees it as an evolution of the CGI style that was pioneered at Rare with the likes of Donkey Kong Country and Killer Instinct. You can watch our full interview with Nic above, but points of interest include a potential sequel, DLC for the game moving forward and - perhaps most exciting of all - an online multiplayer mode. Nic insists it's something he wants to see in the game himself, so if it sells well enough, we could see it added at a later date. Are you a fan of old-school scrolling fighters? 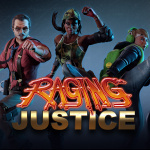 Will you be picking up Raging Justice now you've see our interview and know the price? Let us know with a comment. Looks brilliant. We're long overdue a new one of these - far too many 2D "metroidvania" types clogging up the eShop. I used to spend ages playing 2 player Turtles in Time, Streets of Rage and even that Simpsons arcade game. @N64SNESU yeah man the $38 i paid for my first switch after trading in my wii and the $230 i paid for my second sure are awful compared to the 5 hours a day i get out of it. I'm not really into that retro-rendered cg look. It doesn't look bad but it's just not my particular taste. I would have preferred really awesome sprite art. Good price though. Headquarters are informed that a random internet guy wants the price slashed and said they are looking into it. Not a huge fan of the art style but it looks fun. I’m glad so many of these games are making a comeback. Streets of Red is my current favorite modern take on the genre. Hope this is as good or better. Definitely grabbing it. My switch deserves dark souls, but that’s nawt to be seen. It looks like the controls are a little loose to me. But hopefully the hands on say its tighter. Looks good and it's a shame Sega won't make the obvious one that everyone wants. I'll be picking this up but I have to say that The Takeover still looks like the best of the bunch, at least the art style is better than Streets of Red and more befitting of the legacy. If only Battle Toads would become a reality. A hilarious and fun game. Way ahead of its time. Well I've had my eye on it and I think it looks really good. I may wait to find out if the controls are tight but the 10% discount is tempting (not that it's a lot). I've always liked this genre though I haven't completed many of the games. I remember the Xmen arcade game quite fondly along with Bad Dudes and Double Dragon. I’m still waiting that Sega release the true successor to Streets of Rage (in the way they did it with Sonic Mania). Or at least a cool remake of the trilogy with additional contents and hd 2d graphics. I prefer classic sprite work, so I was a bit concerned when I got to the part saying prerendered graphics. After seeing some clips, it looks rather good. They managed to incorporate a lot of style in their characters and the animation looks good. Those were often issues with those graphics in the past. I'm more excited for The Takeover, personally. This guy likes what I like, so this game seems like a safe bet for a buy. Day 1 purchase! I appreciate how Nintendolife highlights Nindie Developers! The colors and typography used on "Raging Justice" are the most horrible I've ever seen. The game looks fine though. The week this releases is turning into an expensive one. Hyper Light Sentinel ,Immortal Redneck ,Garage and now Raging Justice. I think Super Sidekicks 2 also releases that week.With Street Fighter 30th Anniversary Collection ,Little Nightmares and one other I forget the name of,also coming later in the month May could well be my most expensive gaming month yet.Kind glad Dark Souls was delayed. looks good but yeah that title card needs a rework. The art style is growing on me but from the sounds of it, the devs are putting their hearts into this game and they deserve their hard work to pay off. They have my money. Sold. $15 with a bargain no less is a steal. Wish they would include online multiplayer upfront though. @Axlroselm How about a new Dynamite Cop game. @LordVal Which games would they be? From a quick look at their website and the guys history ,he seems to have a pretty decent background.Senior roles at Rare working on Perfect Dark Zero and Kameo :Elements of Power ,both well received games as well as helping design Xbox Avatars. He also had smaller roles working on Viva Pinata:Pocket Paradise ,Banjo-Kazooie: Nuts & Bolts and both Kinect Sports games as well as F1 Race stars for Codemasters. Ok the latter wasn't too well received but it can hardly be classed as one "of the worst games ever seen" and the fact he had a small role on it ,I can't see how it diminishes his previous work in any way. So I'm curious ,what are these worst games ever seen that's he's been involved with ,I'm assuming you know of other stuff? Looking forward to this one. Streets of Rage and Fighting Force were great fun, so I'm glad to see this genre make a resurgence. Thiss is why i didnot pick up streets of red. Cause i know this was just round the corner seems like a steal. If gameplay is good too then day one of course!. @N64SNESU Oh ho boy, get ready for a barrage of insults from the Nintendo life brigade. I just wish Sega would release the Streets of Rage trilogy on the Switch. I would buy that in a heartbeat. One of favorite genres. Long over due for a Nintendo system. Keeping my hopes up for a decent review. Definitely on my radar. Haven't watched the video yet but I'm going to hold out for a physical copy! But yes I'm jumping in. Why is this only 2 players??? @BARSAMAN Thanks man, yeah getting on a bit now! I remember playing the Simpsons arcade in a Florida hotel with my brothers while my parents sat by the pool...seems so long ago! @OorWullie I don't want to spread hate. Just my opinion. Kameo and Perfect Dark Zero were day-one titles back then, when I bought my 360. For me (maybe really just for me) they are the worst Rare-Games ever played. After the glorious N64-times for Rare and after they turned their back to Nintendo and went to Microsoft everything went down. "well received"? I remember that these games were not just for me a big disappointment. It was a big deal between Rare and Microsoft and they were the first games on 360, so I will never forget these games, because they were the reason, that I thought it was the wrong decision to buy a 360. That's the reason for me to call them "one of the worst goat". It's just so formative. Looks brilliant? Looks clunky, awfully drawn and animated and with poor hit detection to boot (at this stage of development.) This guy's previous projects at Rare were after that company's heyday and this title looks just as ugly as Kameo and PDZ. I have zero confidence that this will be anything but an easily forgotten and critically panned hot mess when it arrives. @AirElephant You may be right. Looked good from the trailer but i had my nostalgia specs on. Hope this turns out good. I did into Wulverblade and Sengoku 3 regularly so another quality beat 'em up would go down a treat! I love the idea of another Streets of Rage or Final Fight but the CGI look and poor animation just isn’t pleasant. Looks kinda meh to be honest. Probably candidate to free game of the month with your exclusive Premium Nintendo Network Subscription only $19.99 a year. Get access to this and much more! Subscribe now! I have been waiting since this was announced for the Xbox One. I’m intrigued by this as someone who raged in the streets multiple times in my youth this feels very familiar and seeing these actions in real life are currently frowned upon I look forward to engaging in them in this digital medium. @LordVal What the hell are you talking about? Streets of Rage arcade was highly popular. On busy days people were almost fighting for spot at the cabinet to play the game lol. Next to Street Fighter and Mortal Kombat, Streets of Rage was great fun! I always liked to play these games in the Arcade halls more than at home on console/PC, due to the social aspect. I'm as excited about this game as I am any coming out this year. Day one. Stull not sold on that art style. I understand the idea behind it, but it does not look great to me. Hope they release a demo. @Jeronan who mentioned Streets of Rage? What are YOU talking about? Brawlers are awesome! And I hope this one too. But I'm just unsure about this because of this guy's background. Let hope the bear is a playable secret character.